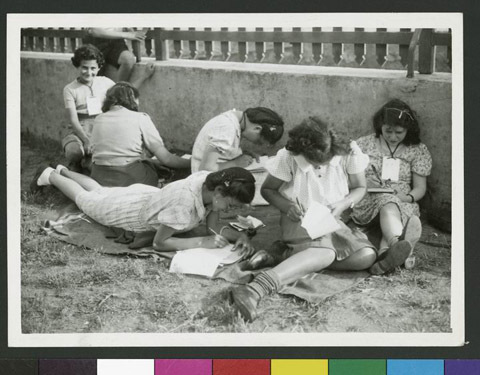 JDC - Archives : A group of French Jewish refugee children sitting outside writing letters to their parents. Title A group of French Jewish refugee children sitting outside writing letters to their parents. Description A group of French Jewish refugee children, who were rescued from internment camps and brought to Lisbon by JDC, writing letters to their parents. Many are still in the camps, while they await transport to the US. They are wearing the id tags from the American Friends Service Committee. JDC collaborated with AFSC during this period, particularly in Germany, Austria, Czechoslovakia, and France.